Edmund Charles Tarbell (April 26, 1862 – August 1, 1938) was an American Impressionist painter. A member of the Ten American Painters, his work hangs in the Boston Museum of Fine Arts, Metropolitan Museum of Art, National Gallery of Art, Smithsonian American Art Museum, Corcoran Gallery, DeYoung Museum, National Academy of Design, New Britain Museum of American Art, Worcester Art Museum, and numerous other collections. As a youth, Tarbell took evening art lessons from George H. Bartlett at the Massachusetts Normal Art School. Between 1877 and 1880, he apprenticed at the Forbes Lithographic Company in Boston. In 1879, he entered the School of the Museum of Fine Arts, Boston, studying under Otto Grundmann. He matriculated in the same class with Robert Reid and Frank Weston Benson, two other future members of the Ten American Painters. 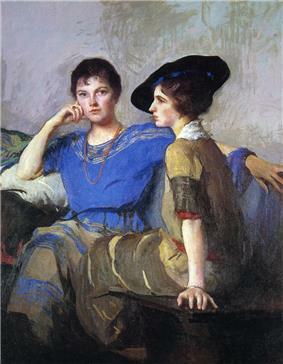 Tarbell was encouraged to continue his education in Paris, France, then center of the art world. Consequently, in 1883 he entered the Académie Julian to study under Gustave Boulanger and Jules-Joseph Lefebvre. Paris exposed him to rigorous academic training, which invariably included copying Old Master paintings at the Louvre Museum, but also to the Impressionist movement then sweeping the city's galleries. That duality would inform his work. In 1884, Tarbell's education included a Grand Tour to Italy, and the following year to Italy, Belgium, Germany and Brittany. Two years after returning to Boston, at age 26 Tarbell married Emeline Souther, an art student and daughter of a prominent Dorchester family. Preferring to work from posed models, Tarbell often painted those immediately at hand—his wife, four children (Josephine, Mercie, Mary and Edmund Arnold Tarbell), and grandchildren. The paintings illustrate their lives. 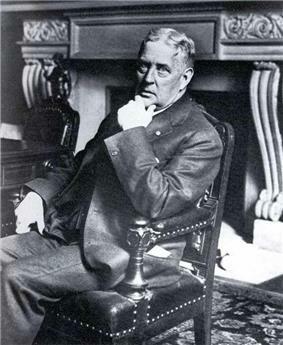 While teaching at the Museum School in Boston, Tarbell and his family lived from 1886 until 1906 in the Ashmont section of Dorchester, the house belonging to his stepfather, David Frank Hartford. Then they lived on Commonwealth Avenue in Boston at the Hotel Somerset, located beside The Fens and not far from his atelier in the Fenway Studios on Ipswich Street. In 1905, they bought as a summer residence a mantelpiece attributed to Ebenezer Dearing (1730-1791), a master Portsmouth ship woodcarver. The Tarbells eventually retired to New Castle. In 1889, Tarbell assumed the position of his former mentor, Otto Grundmann, at the Museum School, where he was a popular teacher. He gave pupils a solid academic art training: before they learned to paint, they had to render from plaster casts of classical statues. His students included Margaret Fitzhugh Browne, F. Luis Mora, and Lilian Westcott Hale. So pervasive was his influence on Boston painting that his followers were dubbed "The Tarbellites." ^ "Book of Members, 1780-2010: Chapter T". American Academy of Arts and Sciences. Retrieved 10 April 2011. "Edmund Tarbell contributed to America's place in the world of art. To him and his work Europe turned its eyes in admiration, as did the whole people in America. Tarbell's works were honest works. In him was none of the transient sensationalism which brought notoriety to others. Tarbell canvases will be speaking to the world centuries from now. His character was as true as his art." Tarbell won many art prizes and medals, an honorary doctorate from Dartmouth College in 1929, and served as juror of painting at the 1904 Louisiana Purchase Exposition, the 1915 Panama-Pacific International Exposition, and the 1926 Sesquicentennial Exposition. He was elected a full member of the National Academy of Design in 1906, and a fellow of the American Academy of Arts and Sciences in 1927. Tarbell painted portraits of many notable individuals, including industrialist Henry Clay Frick, Yale University President Timothy Dwight V, and U.S. presidents Woodrow Wilson, Calvin Coolidge, and Herbert Hoover. 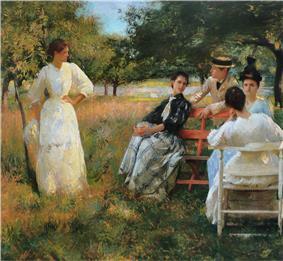 His 1891 plein air painting entitled In the Orchard established his reputation as an artist. It depicts his wife with her siblings at leisure. Tarbell became famous for impressionistic, richly hued images of figures in landscapes. His later work shows the influence of Johannes Vermeer, the 17th-century Dutch painter. 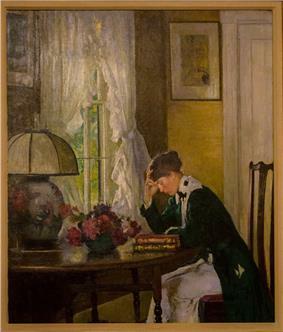 In such works, Tarbell typically portrays figures in genteel Colonial Revival interiors; these studies of light and tone are executed with restrained brushwork and color. In 1918, Tarbell was hired as principal of the art school at the Corcoran Gallery of Art in Washington, a position he held until 1926. But the Museum of Fine Arts wanted him back at the Museum School, appointing him in 1925 as Chairman of the Advisory Council. For two years he promoted and oversaw construction of the school's new building designed by Guy Lowell. In 1930, however, the school asked Augustus John to recommend English artists as instructors. Tarbell and Benson, advocates of indigenous talent, would again resign.